Pharmacokinetics is the study of how a drug moves through the body system – what the body does to the drug. 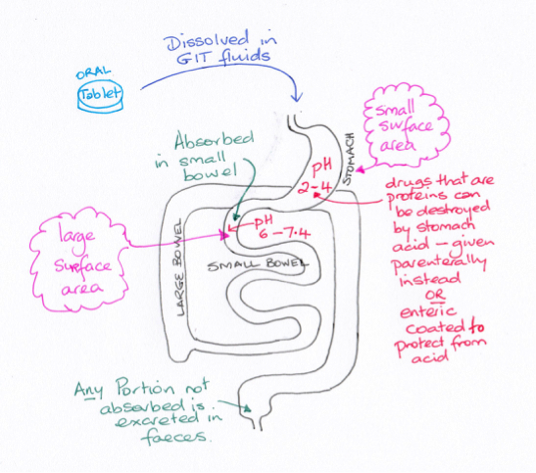 When a drug is given orally it must be absorbed from the gastrointestinal tract (GIT) and then enter the blood stream. Intravenous drugs (IVI) bypass the GIT entirely. Intramuscular injected (IMI) drugs take advantage of the high blood flow of the muscles to deliver the drug to the systemic blood supply. The dense capillary networks in the rectal walls or those under the tongue enable drug absorption of lipid soluble drugs directly to the systemic blood avoiding the GIT. Some drugs used to treat GIT microbial infections are useful because they are not absorbed and consequently remain in the GIT lumen affecting the gut bacteria. These drugs are excreted in the faeces. The stomach is highly acidic which can destroy some drugs especially if they are proteins in structure. For this reason some drugs are covered in a coating (termed enteric coating) to prevent stomach acid damage of the chemical structure before the drug reaches the duodenum. In theory, drugs that are acids will cross the cell membranes more readily from the stomach, since an acid in an acid does not ionise. An example would be aspirin. 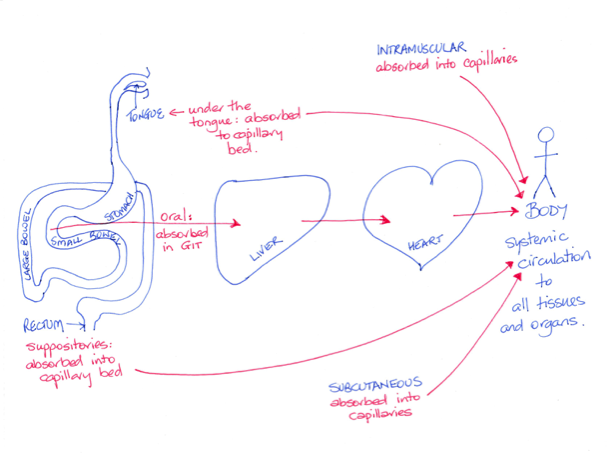 However, the stomach does not have a large surface area for absorption. The small bowel does have a very large surface area. Aspirin, since it is an acid, will ionise in the alkaline environment of the duodenum hindering its absorption across the membrane – however, enough of the drug will cross to have a therapeutic effect due to the very large surface area. Where the drug travels to is described as the drug distribution. Where it is distributed to will depend on its chemical composition and it ability to cross cell membranes as well as the blood tissue perfusion. Blood from the GIT travels first to the liver via the porta hepatitis and then leaves the liver via the hepatic vein returning to the heart. The drug (and any drug metabolites) is then carried in blood plasma to reach its target. A proportion of drug molecules, upon reaching the blood plasma, will bind to proteins and lipoproteins, usually reversibly. An example of highly protein bound drug is warfarin. Warfarin, an anticoagulant, is 99% bound with only 1% of the drug not bound, that is, free to be distributed to tissues and have a therapeutic effect. As the binding process is reversible, as drug leaves the blood to enter the tissues more is released from the albumin to become free for distribution. Drugs can compete for binding sites, influencing the bound and free portions of the drug particularly if the excretion rate is compromised. There are barriers to drug distribution from the systemic circulation such as the blood brain barrier. A lipid soluble drug can cross this barrier and other physiological barriers such as the placental barrier by diffusion, but a water-soluble drug is much less likely to cross the membranes. Examples of this can be seen with the anti-histamines included in cold and flu tablets. The daytime tablet includes a nasal decongestant with less sleep effect whereas the night-time tablet may contain one that can cross the blood brain barrier creating drowsiness. Some drugs when injected into a compartment are contained by the compartment membranes. For example, an injection into the joint cavity can be contained by the synovial membrane, restricting the drug within the joint capsule. The ideal situation would be that a drug only concentrated at the site of the drug target. However, in reality, that does not happen. Drugs can concentrate in varying amounts in the body’s diverse tissues. When a drug is being trialled, the amount of drug that concentrates in the major organs and the brain is measured. These measurements indicate the maximum concentration of the drug in an organ before damage is caused in that organ. The organ of highest concentration may not be the target organ, and so this value will limit the size of the drug dose that can be given. Metabolism is the process of enzyme action that chemically changes a drug to metabolites. Metabolites may be therapeutically active or not active. The main site for metabolism is the liver. Which is referred to as hepatic or liver metabolism. Drug metabolism can occur elsewhere in other tissues. A group of enzymes known as the P450 enzymes are responsible for metabolism. Metabolic actions can render a drug more water-soluble enabling excretion by the kidneys. Those drugs activated by enzymes are referred to as prodrugs. An example of a prodrug is codeine. Codeine is chemically altered to morphine by P450 enzymes. Enalapril is another example. It belongs to the group of drugs used in hypertension known as angiotensin converting enzyme inhibiting (ACEI) drugs. A drug that is given orally may not reach the systemic blood circulation intact due to metabolism, with only a percentage of the original dose becoming available to the tissues. The size of an oral drug dose is calculated to compensate for metabolism. Drugs that are fully metabolised are not given orally as a therapeutic concentration would not be reached in the plasma. They are given via parenteral routes to avoid the GIT. Bioavailability is the amount of the drug that reaches the blood plasma. If a drug is given intravenously then the bioavailability is 100%. However, an oral dose of a drug may undergo the first pass effect resulting in a bioavailability of less than 100%. 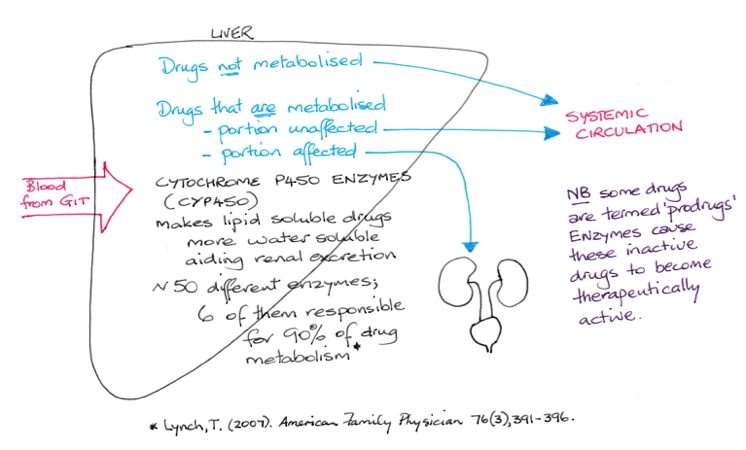 Liver metabolism can render a drug useless in which case the drug is only given by parenteral routes (intravenous, sublingual, rectal, intramuscular). Liver disease can alter the capacity of the liver to produce plasma proteins and so this can have effect on the bound versus free portions of a protein bound drug. Since enzymes are proteins, the cytochrome P450 enzymes are produced according to an individual’s inherited DNA codes (each enzyme has a distinguishing code eg CYP1A2). This means that not every person will have the exact same set of enzymes – there are variants, many of which are now known and many which are still being discovered. An example of genetic variation in P450 enzymes is the enzyme that acts on codeine. Each person inherits one allele for a protein from their father and one from their mother resulting in either a homologous (two the same) or heterozygous (two different) alleles in the child’s DNA codes. This is known as the genotype (See the Inheritance topic). How that allele pair is expressed in a person is called the phenotype. In the case of how a drug affects a person the phenotype is the clinical response. Some patients will complain that codeine does not help their pain level and if this is the case it is likely they have the allele pair that results in them being a poor metaboliser for the drug. Failure to convert the drug to morphine will result in a suboptimal therapeutic effect. Allele variants result in people being categorised as poor metabolisers (PM), intermediate metabolisers (IM) , extensive metabolisers (EM) or ultra-rapid metabolisers (URM) for a number of drugs. Someone who is a poor metaboliser will excrete a lipid soluble drug more slowly than a person who is an extensive metaboliser for that drug. Drug plasma concentrations can be measured by taking blood samples over time. The half-life tells us how much drug is remaining in the plasma and gives an indication of when to give the next dose of the drug to maintain a therapeutic range. The half-life is defined as the point in time when the peak drug plasma concentration has reduced by half. Drugs can be excreted in sweat, saliva, mucous, bile and faeces, and even breathed out such as the anaesthetic halothane. Ethanol, which is a volatile chemical (moves from liquid to gas easily) is highly soluble in blood and is excreted in limited amounts by the lungs. This forms the basis of the alcohol breathe test. However, the main organs of excretion are the kidneys. Some drugs are excreted unchanged in urine whilst others are almost completely metabolised so that very little of the original drug is detected in urine samples. Glomerular filtration and tubular secretion facilitate the movement of drugs and their metabolites into the filtrate that becomes the urine. 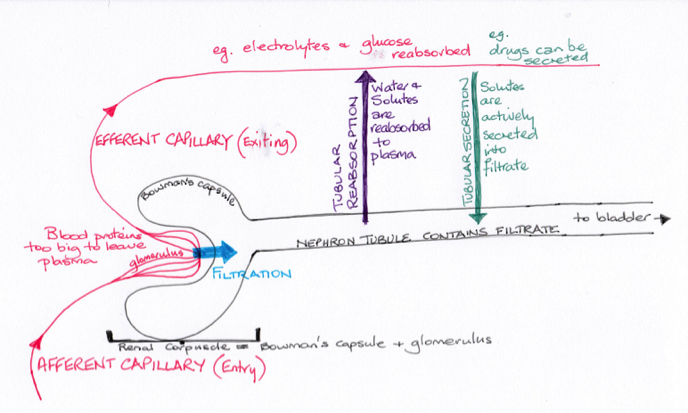 All drugs undergo some level of filtration as the systemic circulation passes through the kidneys. Lipophilic drugs can be reabsorbed by tubular resorption back to the systemic circulation extending the length of the therapeutic range. Water-soluble drugs and metabolites are not reabsorbed from the filtrate. Liver metabolism converts lipid soluble drugs to more water-soluble chemicals aiding in their excretion by the kidneys. Kidneys begin to lose nephrons after the age of 35 years and so renal function begins a very slow decline. Functioning nephrons enlarge to compensate for those that are lost so renal failure may not be detected until very late in the process of decline. Some drugs damage the nephrons and can cause renal failure; others create damage only if the therapeutic drug concentrations are exceeded. Renal damage will slow excretion risking rising plasma drug concentrations and toxicity. Urinary pH will also effect the amount of drug that is reabsorbed by altering the amount of metabolite ionisation. Weak acids are excreted more readily in weak alkaline solution but more slowly in acidic urine; the reverse is true for weak bases. By changing the pH of the urine excretion can be increased or decreased. Drugs excreted in bile, once in the gut lumen, may be reabsorbed into the blood circulation. This is referred to as enterohepatic recycling. The gut bacteria in some cases can reform the active drug. For drugs where this is the case the drug dosages take this recycling into account. An example is the oral contraceptive pill (OCP). It means that any disruption to the bowel flora (such as diarrhoea or the use of broad spectrum antibiotics) can alter the concentration of the drug in the systemic circulation and limit the effect of the drug. In the case of the OCP it may result in an unexpected pregnancy. 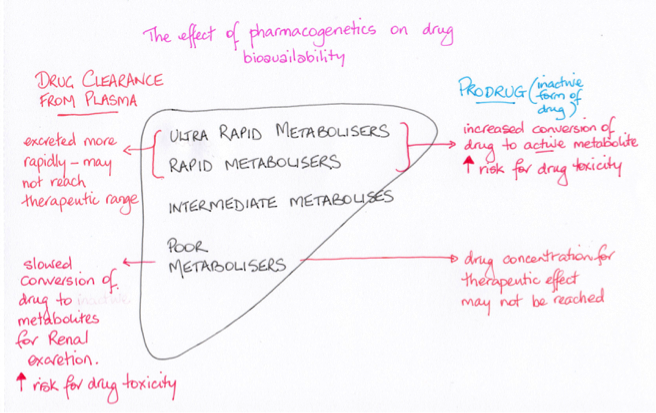 Pharmacodynamics is the study of how drugs interact with cells and their drug molecular targets. ​In order to understand how drugs reach their targets we first need to look at the types of targets available for drug interaction. Basically there are four groups of targets: receptors, ion channels, enzymes and transporter proteins. Drugs that initiate an effect when attaching to a receptor are referred to as agonists. Chemicals that interact with receptor targets may bind them preventing the endogenous chemical from binding to create an effect; these are termed antagonists and sometimes simply described as blockers such as beta blockers (block adrenergic receptors) used to slow the heart rate. Most antagonist drugs bind reversibly and so the effect of the drug diminishes as the concentration of the drug declines with excretion. However, an irreversible antagonist stays bound to the receptor until such time as the protein it is attached to is removed and recycled. Drugs that compete for binding sites can be pushed off the binding site by a drug with a higher affinity for the site. The example often given is the opioid drug morphine which binds to opioid receptors inhibiting pain transmission. The drug naloxone is used to treat opioid drug overdose because it competes with the morphine for the opioid binding sites, pushing it off the receptors and so reversing the effect of the morphine. Morphine is respiratory depressant (among its many other effects) and so in overdose can result in respiratory failure. Enzymes can be important drug targets. Enzymes act to build new molecules or to breakdown molecules. Blocking the activity of enzymes can occur in two ways: the drug blocks the attachment site on the enzyme or the drug provides a false substrate causing the enzyme to make an abnormal product which the body can then not use. Prodrugs, on the other hand, are activated to therapeutically active drugs by enzymes. ​An example is angiotensin converting enzyme inhibitors (ACEI). 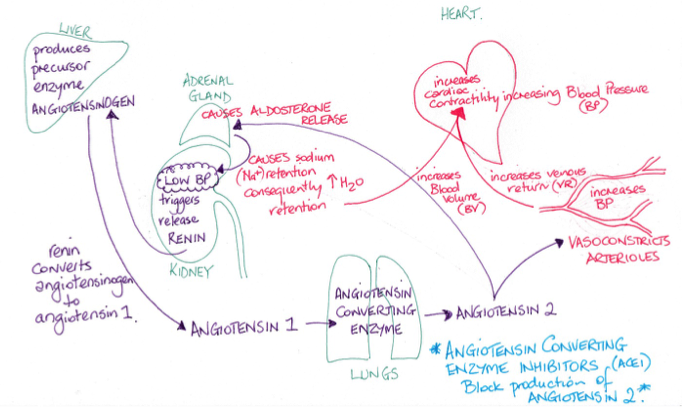 Angiotensin converting enzyme (ACE) causes angiotensin 1 to be converted to angiotensin 2. Angiotensin 2 is a powerful vasoconstrictor and so has a role in controlling blood pressure. It also causes the adrenal gland to release aldosterone which increases renal sodium retention which causes increased water retention leading to an increase in blood volume, adding to a rise in blood pressure. The trigger for the enzyme to cause this conversion of angiotensin 1 to angiotensin 2 is a drop in blood pressure detected by the kidneys which then release renin. Drugs that belong to the ACEI group prevent the enzyme from enabling the production of angiotensin 2 resulting in the blood pressure returning to normal in those with high blood pressure. The electrochemical gradients between the inside and outside of cells are maintained by ion channels. These channels are selective and so determine what can and cannot pass through the channel. Verapamil, a calcium channel blockers used in hypertension, is an example. These proteins assist movement of molecules across membranes. Examples include those for glucose transport. Important transport proteins include those that act to remove neurotransmitters such as noradrenaline from the synaptic cleft between nerve terminals. The group of drugs known as tricyclic antidepressants act to inhibit transporter proteins. This results in the neurotransmitter remaining in the cleft for longer increasing its action. Bryant & Knights (2015). Pharmacology for Health Professionals (4th Edn). Elsievier. Rang, Dale, Ritter & Flower (2007). Rang and Dale’s Pharmacology (6th Edn). Churchill Livingstone.